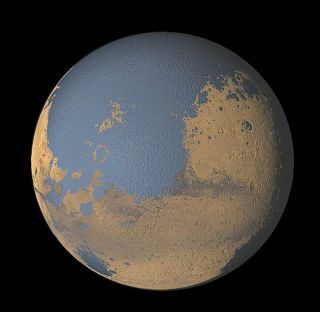 Mars may have once been covered with liquid water oceans, just like Earth. Theyhaven?t yet figured out how to draw blood from stones, but a group of Frenchresearchers is offering new insight that could change how scientists search forsigns of life in Martian rocks. By studyingthe laboratory fossilization of microorganisms, scientists have caught a glimpseinto how early Earth and potentialMartian life might be preserved in rocks. The scientists focused on Pyrococcusabyssi and Methanocaldococcus jannaschii, extremophiles whichthrive in piping hot (up to 176?F), oxygen-lacking (<0.2% of current levels)environments. Somebelieve this sort of hot, anoxic environment is where life may have originatedon Earth, and perhaps even on Mars. ?Environmentalconditions were similar on the young terrestrial planets and traces of earlyMartian life may have been similarly preserved as silicified microfossils,? thescientists write in their study, which appeared in the September issue of thejournal Geobiology. On Earth,some fossils are created when microorganisms are caught in concentrated flowsof silica and other minerals near hydrothermal sources. Instead of studyingexisting hydrothermal ocean vents or hot springs, the scientists imitated thisnatural fossilization process in the laboratory. This allowed them to moreclosely mirror the oxygen-lacking environments of Marsand the early Earth. Effectsobserved in the two organisms were quite different. Most M. jannaschii cellscollapsed and died within a week. They left behind only subtle organic tracesafter inoculation with a silica solution. Many key features of P. abyssipersisted for up to 4 months after inoculation. This created a larger windowfor potential preservation. ?They dofossilize a little bit, but do not survive the test of time,? says FrancesWestall, a paleobiologist at the Centre National de la Recherche Scientifique in Orleans, France, who supervised the research team?s work. DorothyOehler of NASA?s Johnson Space Center, who was not involved in the study, saysthat even though the organisms in the study did not fossilize particularlywell, many ancient fossils have been found preserved in silica. This indicates thatother microbes studied under different conditions might offer a higherpotential for fossilization. Thescientists did note in their study that a particular substance produced by themicrobes has more staying power. This substance could provide proof of lifeeven when the actual bodies are long gone. The dead,fossilized bodies of microorganisms can be difficult to find in ancient rocks.Many rocks have been chewed up and spit out by Earth's tectonic recyclingprogram, which pulls rocks under the Earth?s crust and heats them. Other rocksthat manage to avoid this geological processing are still subjected todegradation by wind or rain weathering. Scientists can work around this by lookingfor evidence of life that can survive over time, such as biomolecules. Bysearching for substances associated with life, scientists can determine whetheror not life existed when the ancient rocks formed. Some rocks aremade when dirt gets trapped in biofilms - sticky mat communities that arecreated when microbes excrete starch-like substances called "extracellularpolymeric substances," or EPS. After the organisms in these biofilms die,the dirt in their mats turns to stone ("lithifies"). Ancient lithifiedbiofilms could potentially still contain chemical evidence of the life thatcreated them. This newstudy notes that EPS excreted by the microbes fossilizes quickly, becoming partof the rock. Because of this, EPS could be on the list of biological substancesthat indicate life was once present. Oehler pointsout, however, that EPS in a rock could be the result of organisms entering the poresof the rock long after it initially formed. This means that while EPS could bea red flag indicating life, additional tests must be done to determine whether theEPS is the same age as the rock or was introduced by colonizing microbes at amuch later date. ? Knowingwhen life was present is important for scientists who study the emergence of lifeon Earth. Many believe that life appeared 3.5 billion years ago or even earlier,but fossils dating that far back in time are highly controversial. While someargue that the microscopic forms show strong evidence of having once been life,others say these so-calledancient fossils are just non-biological mineral deposits. Pinningdown the time of life?s emergence on Earth has implications for the search forlife on Mars. The environments of early Earth and Mars are thought to have beensimilar in the distant past. There is evidence that the Martian surface mayhave been covered by oceans, lakes and riversof flowing water 3.5 billion years ago, and these water-rich conditions mayhave persisted episodically on the Red Planet until about 3 billion years ago.New findings show that frozen water sits below the Martian surface at this verymoment. If Mars was Earth-like around the same time that life emerged on Earth,then it seems possible that life also could have emerged on Mars. ?If lifeappeared on Mars, there is a high probability that the traces of those lifeforms were preserved by fossilization with silica or other minerals,? thescientists write. ?Since many ancient microfossils on Earth are preserved in aform of silica called chert, this gives high hopes for the finding of possiblepast Martian life forms.? Althoughthe rovers Spirit and Opportunity are still investigating the surface of Mars,they are not able to study the rocks in great enough detail to find evidence oflife. ?We had to use high-resolution imaging technology to study themicrofossils,? says Westall. ?We can?t do this on Mars. The bottom line is thatwe will probably need to study rocks that have been carefully chosen andreturned from Mars.? SPACE.com Video Show: What Went Wrong on Mars?